An electronic component/part is any basic discrete device or physical entity in an electronic system used to affect electrons or their associated fields. 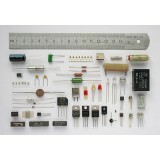 Electronic components have two or more electrical terminals (or leads). These leads connect, usually soldered to a printed circuit board, to create an electronic circuit (a discrete circuit) with a particular function (for example an amplifier, radio receiver, or oscillator). Basic electronic components may be packaged discretely, as arrays or networks of like components, or integrated inside of packages such as semiconductor integrated circuits, hybrid integrated circuits, or thick film devices.